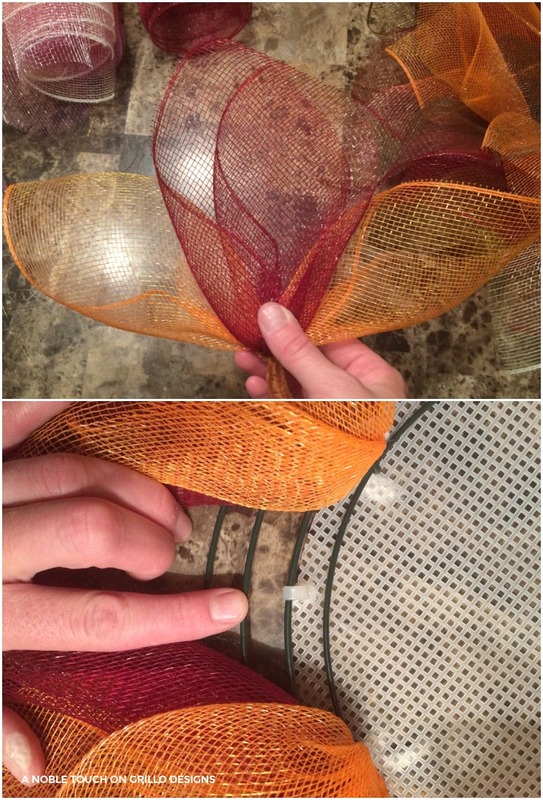 A step by step guide on how to make a gorgeous autumnal flower deco mesh wreath . Video tutorial also included. Hi everyone. It’s Michelle from A Noble Touch! This is my deco mesh flower wreath that I have been working on perfecting for over a year. You can play around with any colors that you like. They always turn out beautiful! 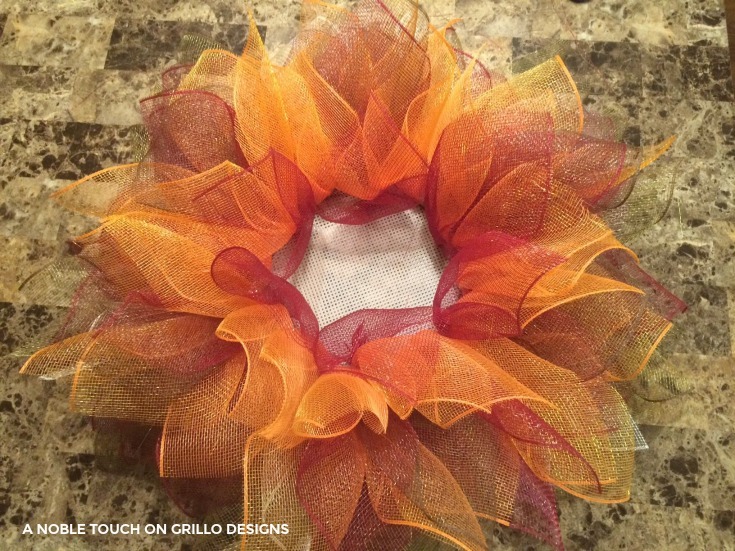 This wreath is perfect for Fall! I hope you enjoy it and don’t forget to visit my Etsy store A Noble Touch to see more and/or purchase any of my wreaths! STEP 1: Paint your foam center using your desired color. 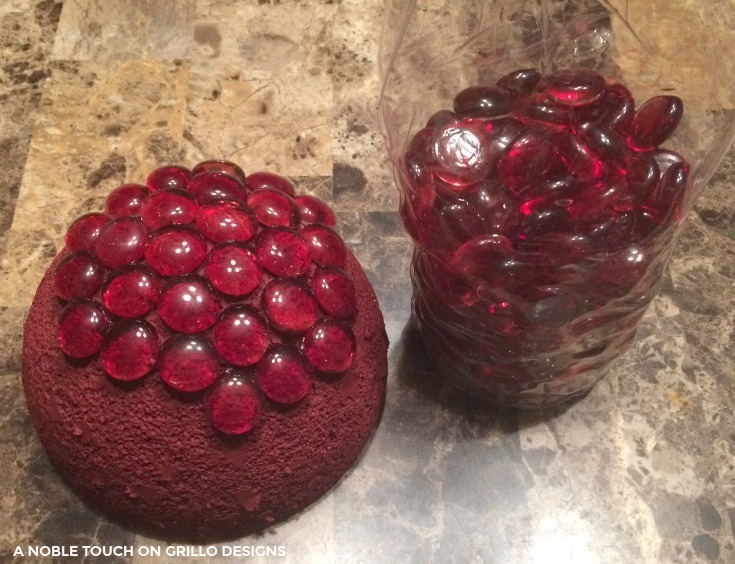 Attach the glass gems with hot glue. 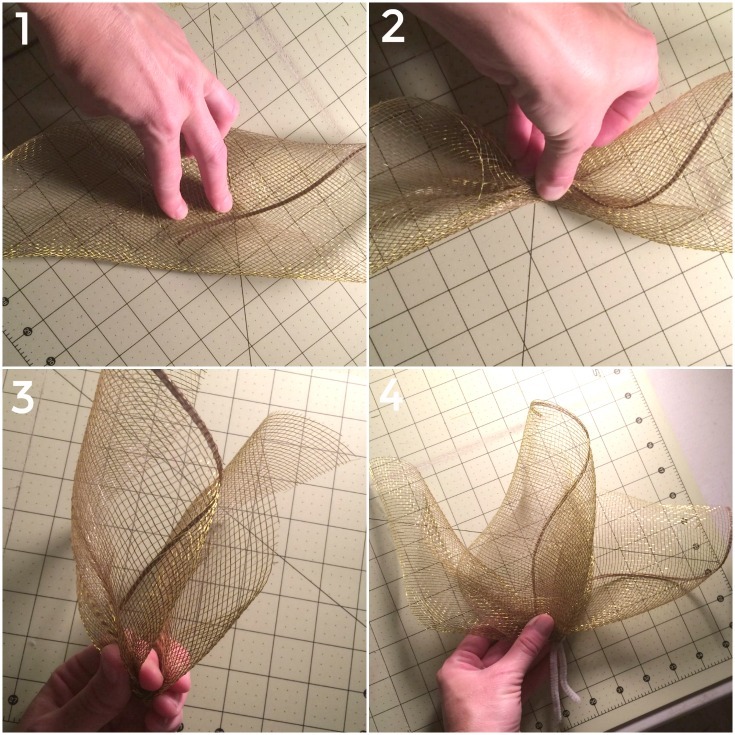 STEP 2: If you are using 21″ mesh, cut every 10″ and then cut in half at 10.5″. 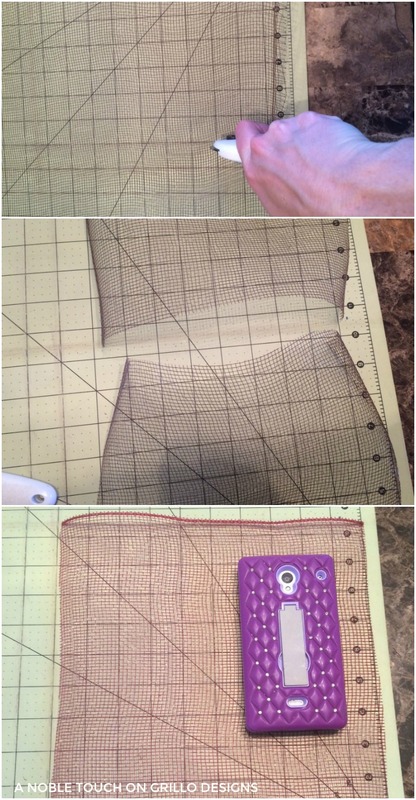 If you are using 10″ mesh, just cut every 10″. 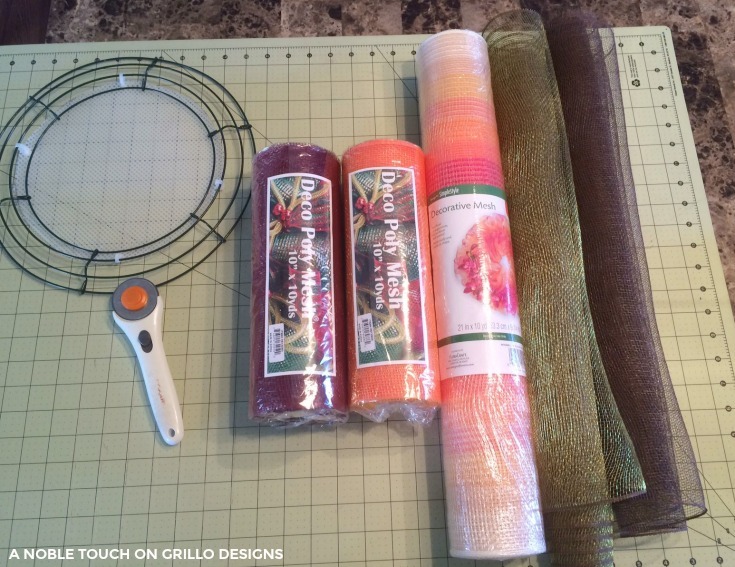 You will need 12 10″ Green/gold, 6 10″ Brown, 18 10″ Burgundy, 18 10″ Orange/Gold, & 36 10″ Ombre cuts for a total of 90 pieces of mesh. STEP 3: Fold mesh from corner to corner, pinch together in the middle and fold up, so they have a petal look to them. Then take second piece of mesh, fold corner to corner, pinch at middle, twist and fold over itself. Insert first fold into second fold and attach with a pipe cleaner. 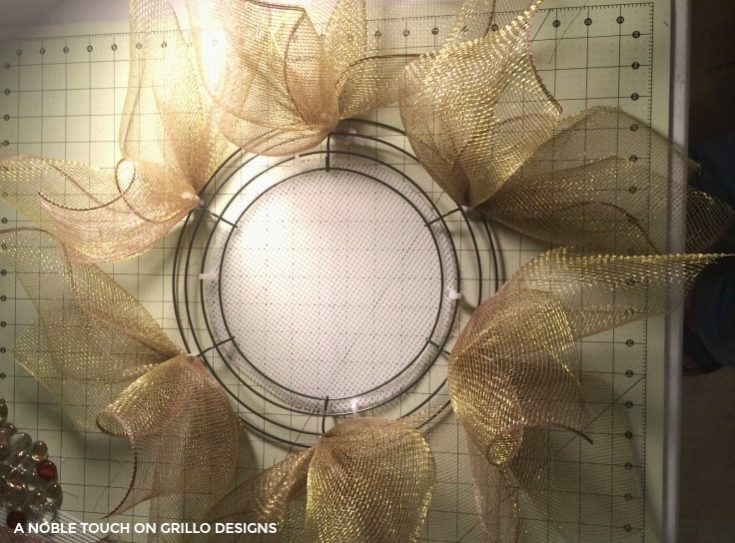 Then attach the green/gold to the outer ring of each of the six sections on the wreath frame. STEP 4: On each of the six sections, second rung in, attach the burgundy and ombre petals together and attach to frame. STEP 5: On each of the 6 sections, third rung in, attach the orange/gold and burgundy petals together and attach to frame. STEP 6: Attach the orange/gold and brown petals together and attach in between each section on the second ring from the outside. 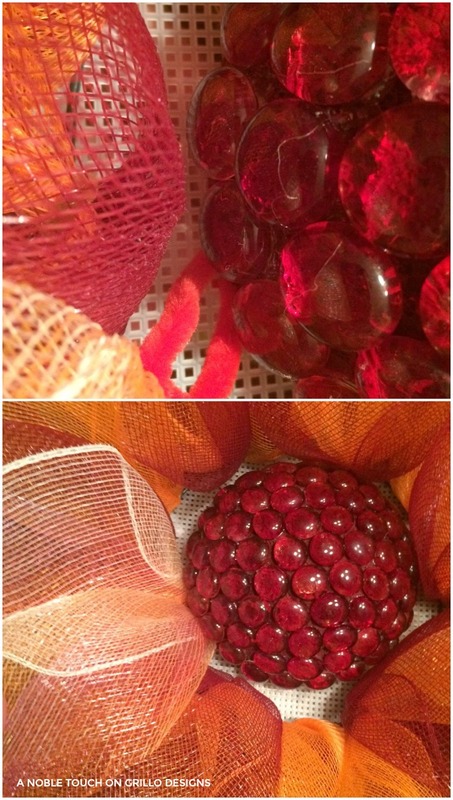 Then attach the burgundy and orange/gold petals in between each section on the last ring to the inside of the frame. STEP 7: Now that all the outer petals are in place, attach your center to the grid, using hot glue. 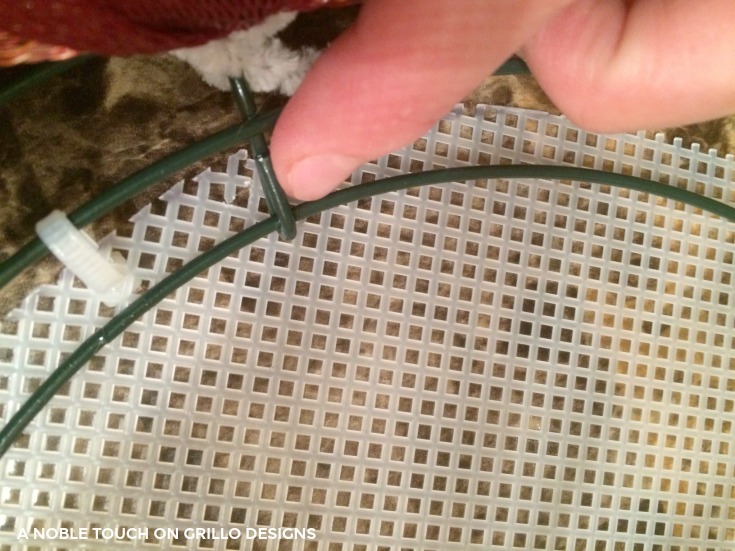 Then turn over and cut some of the florist wire into about 1 1/2″ lengths and then fold and attach to the back of the grid into the back of your foam center to better secure it into place. 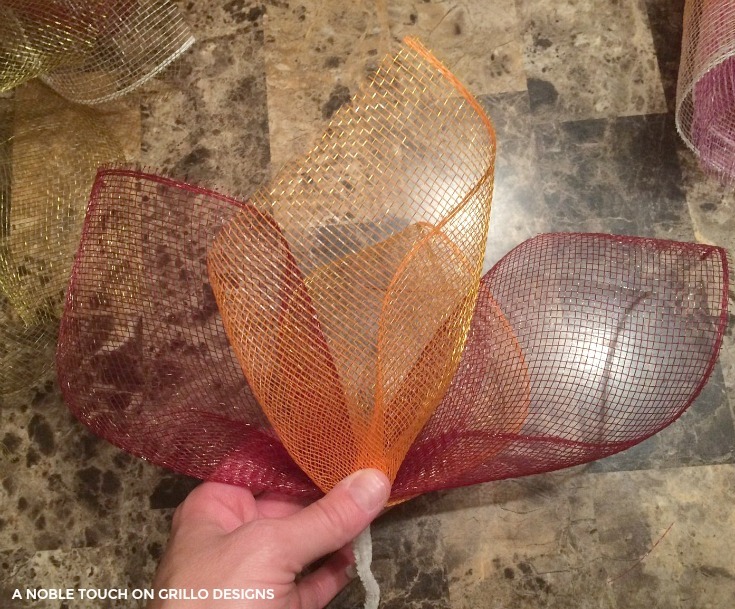 Step 8: Using your ombre mesh, do a single twist fold and attach closely to the center of your flower all around it. This usually takes 30 individual petals. 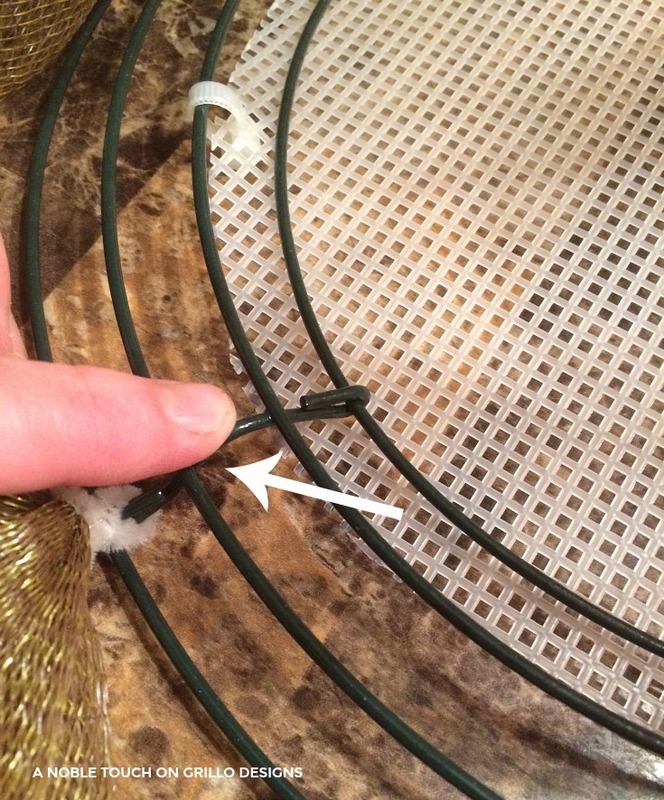 Trim your mesh that might be frayed and you can spray with an adhesive to help it from shedding. 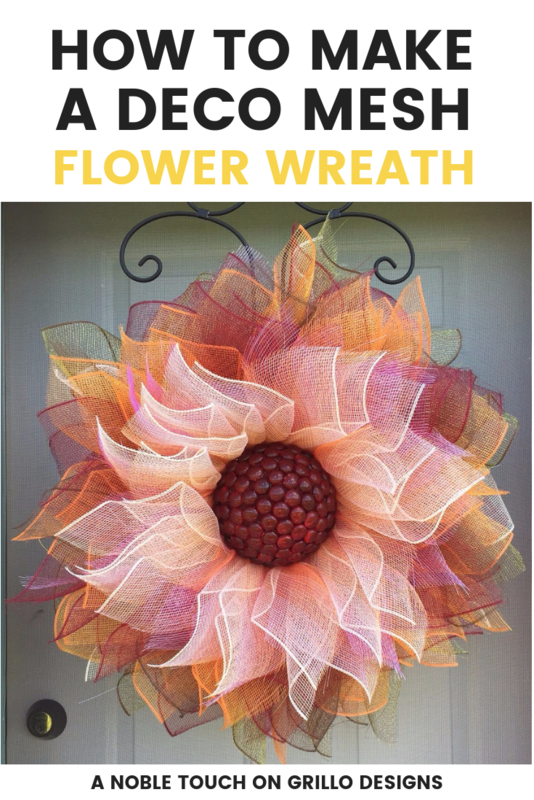 WE HAVE SOME OTHER GREAT WREATH TUTORIALS THAT YOU MIGHT LIKE TOO! I made a flower wreath (my first flower ever) over the weekend for my aunt to give as a Christmas gift. Your tutorial was amazing. My wreath looks great! So clever… I already have requests for more! Thank you & have a merry Christmas!! My center is so heavy after adding the glass gems. Have you ever had it fall off from the weight even with the wire and hot glue? 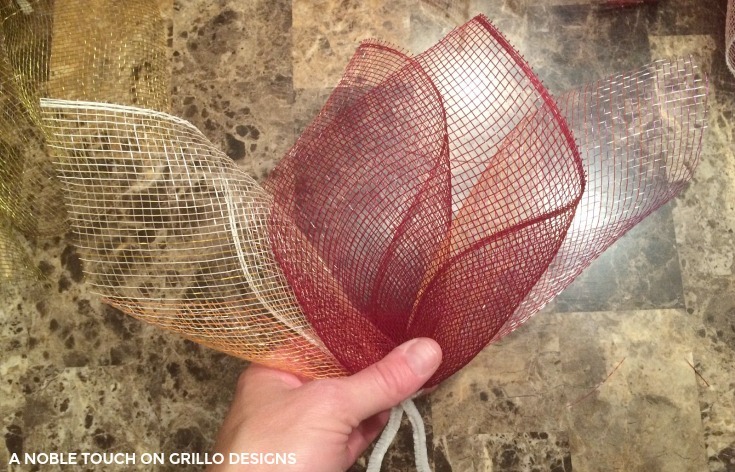 I buy my mesh from several places, Walmart, JoAnn Fabrics, Craftoutlet, Papermart… Tons of colors to choose from. Could I make the center petals smaller and still get the same effect I want the ring right around the center to be darker than the other petals and smaller like a real flower often has. I do not know how I would go about doing this though. 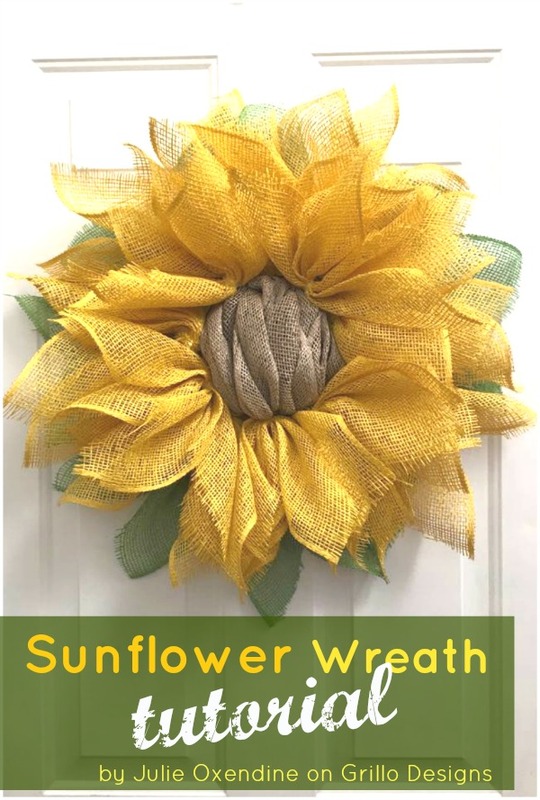 This tutorial made my day I want to make a sunflower one for my fiancé for our new place since sunflowers are his favorite. Yes. Add another piece of mesh or two? in the darker color, cut a third smaller than the original measurement calls for. Incorporate dark color into the sections you tie onto the last ring, working the darker color to the front, next to center. Hi Stephanie, Yes you can try cutting about 8″x8.5″ and do the same fold.. 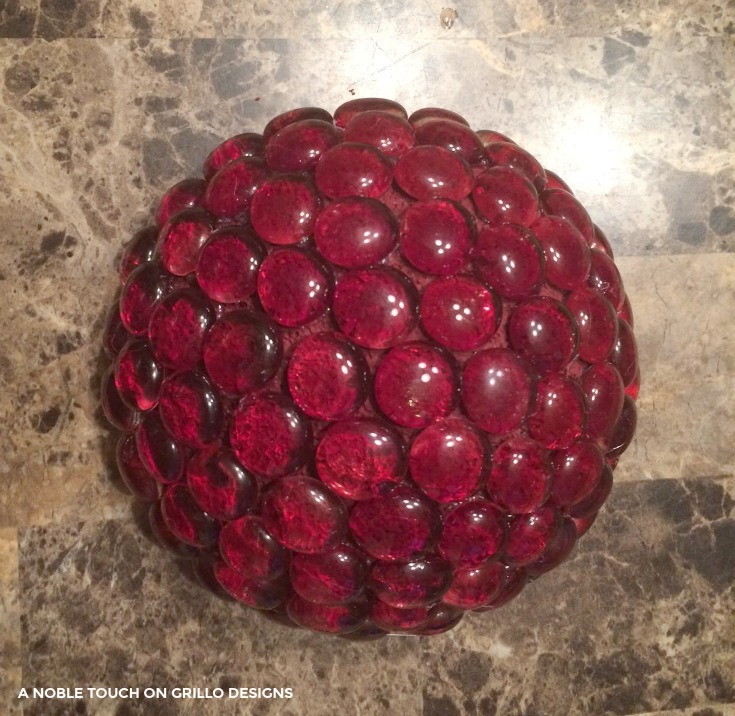 I always try to incorporate different colors, but I have been thinking of the smaller petals around the center as well.. I was wondering if I double the size of the wreath, which means doubling the number of squares I cut of each color, will I have to buy more than one roll of any other than the ombré? I know I’m going to need at least 2 rolls of the ombré. In other words, how many squares can you get from one roll of mesh? 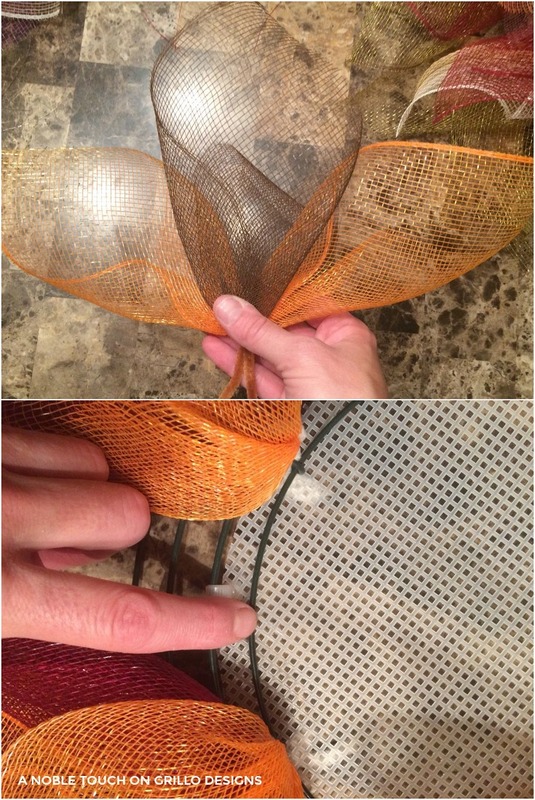 I’m making the flower wreath with the deco mesh ribbon. 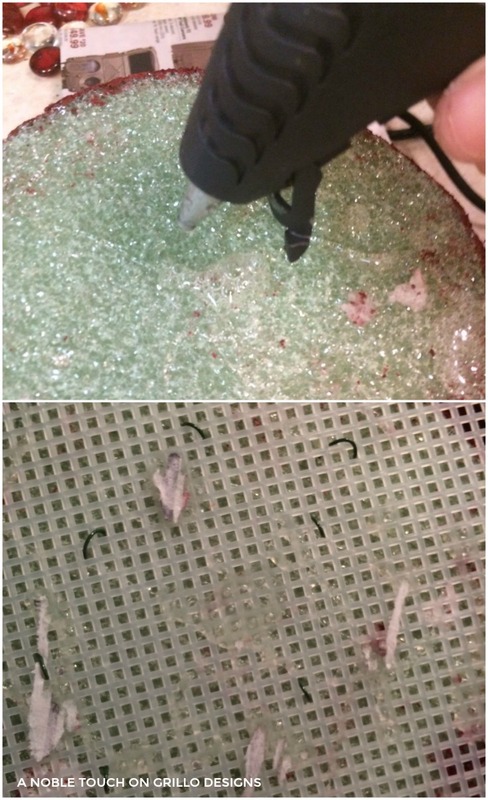 Last night I hot glued all my glass stones to the foam but when I woke up they were falling off. Who do you keep them on? Also, I started using e6000 glue but it’s eating away the foam and now I think I ruined my center. How do you keep the cut side from raveling on mesh cuts?? I’m on my second flower after seeing your tutorial and finally noticed this comment with the new cutting method. It works 100 times better to reduce fraying. thank you so much for sharing! 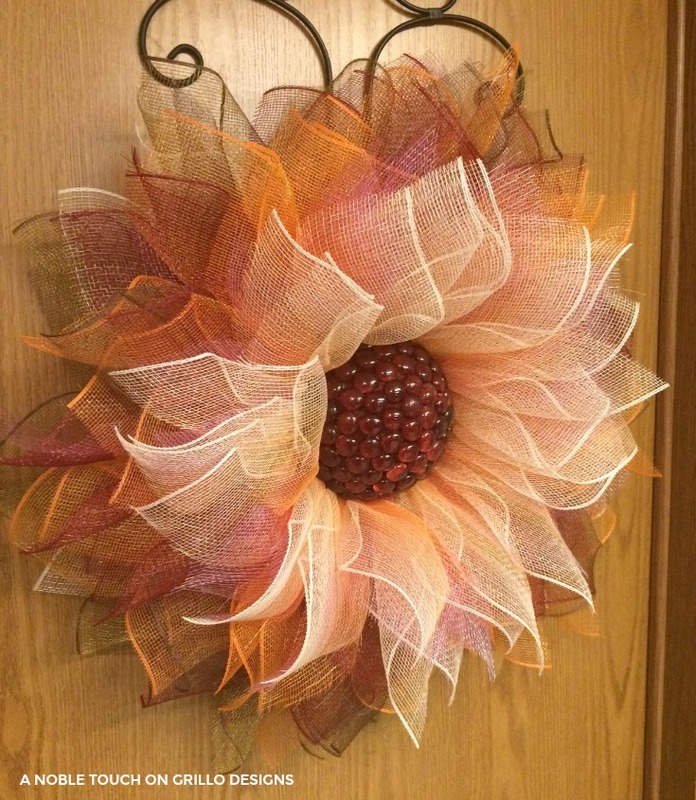 Peggy – Need to know what type of wreath to use .. I was looking on Craft Outlet Website and I see three types – Box Wire Wreaths / Work Wreaths and Wire Wreaths … which do I use and what were the sizes you used. What is the size of the hat you used? What is the size of the nose? What is the size of the mouth. I love this wreath so much I had to make it myself but I keep having trouble with the gems falling off of the Center. Any suggestions how to keep the gems from falling off? Make sure your center is allowed to completely dry.. I usually wait at least 24 hours after painting it before gluing the gems on. Then I use Gorilla brand glue sticks with a hi setting on my glue gun. Hope this helps!! These are absolutely beautiful!!! Keep up the great work and I hope you sell tons of them. Great job! Ooh, that is gorgeous! Thanks for sharing at #HomeMattersParty. 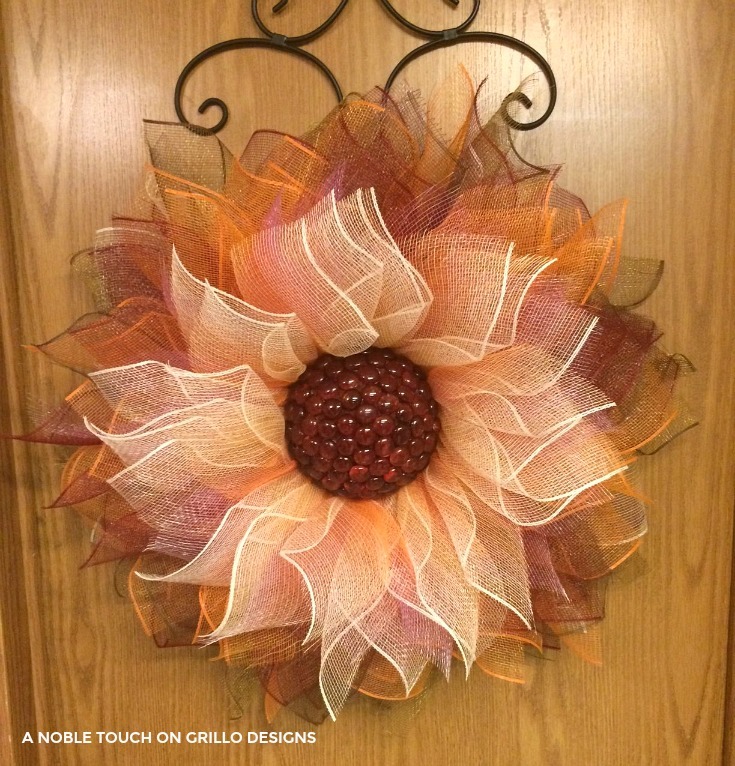 Beautiful wreath and great tutorial! I love your beautiful wreaths as well. I would like to purchase the Deco mesh flower wreath, but I don’t know how to go about purchasing an Etsy gift card or how much to get. I figure at least a $25 and a $50; would that cover it? If not, I’ll get one for $100.00. Just let me know how. Do you accept any other form of payment…check…debit card…charge card? & really inexpensive it is to make. 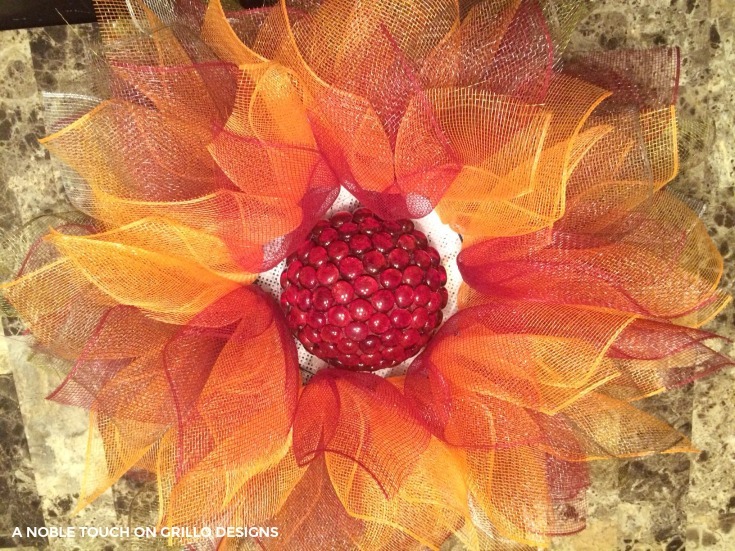 This design will make gorgeous wreaths for all seasons & holidays! 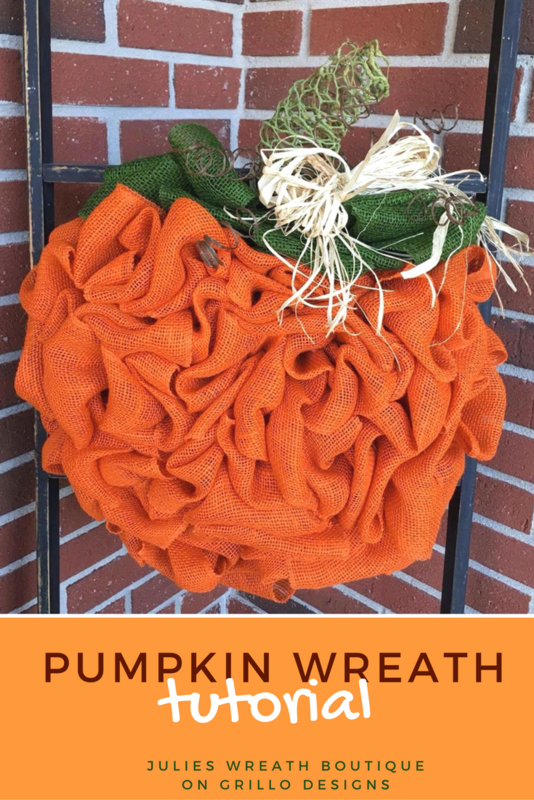 Yes, you can use this wreath for all the seasons! Love all the great wreath ideas you have on your site especially this one. Thank you! 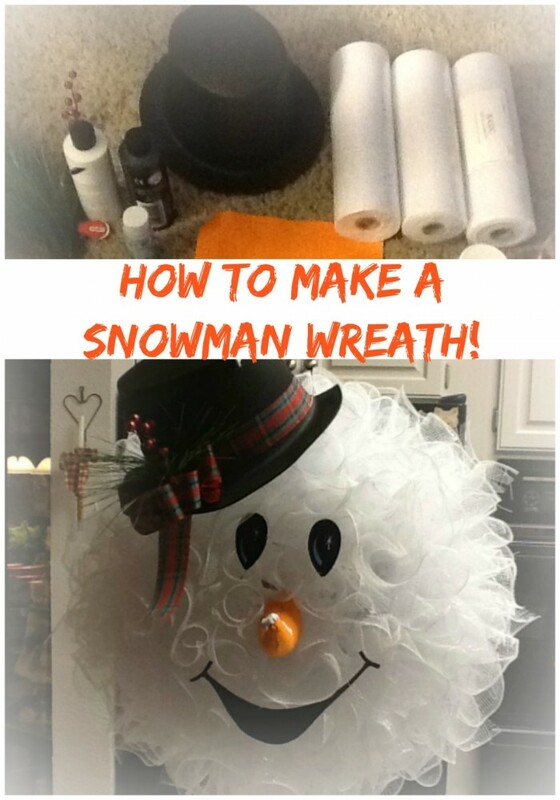 There ARE some awesome wreath ideas on here!! Beautiful! This wreath will look good on our Christmas Door-to-be. Yey! 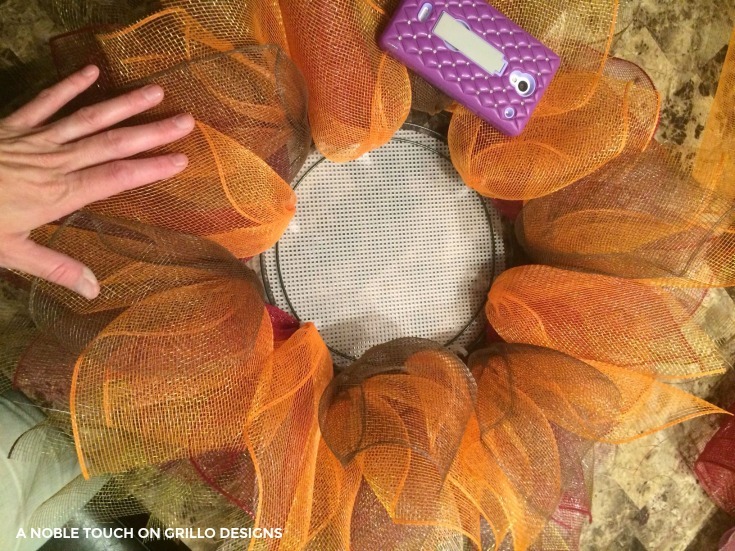 I love your deco mesh flower wreath! It’s beautiful! I especially like the color combination and the glass gem center! So unique! Thank you so much! I really enjoy coming up with different color combinations!